Did you know that your choice of chair and table rental plays a huge part in setting the mood for your event? 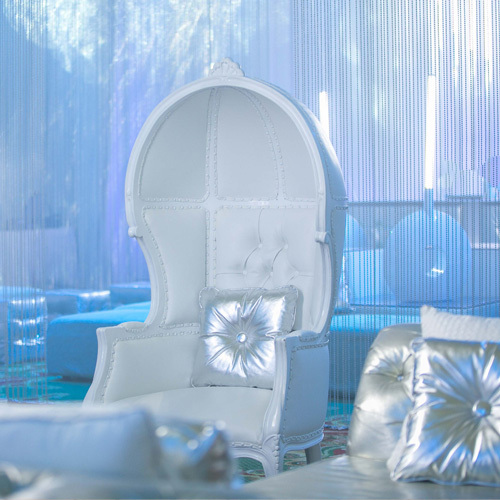 Picture the guest of honor seated on a throne chair or a royal chair. With that vision in mind, imagine the rest of the room. If the whole scene doesn’t match, it can take a lot away from the ambiance you are trying to create. Whether or not the venue for your location is already furnished, you should consider renting your own furnishings. Your furniture selection is one of the most important parts of your entire event. When your guests arrive, they must feel welcome. The theme of your celebration should be apparent. Above all, the room must be vibrant and comfortable. That’s why your chair rental and table rental needs to be done with care. To promote conversation and socializing, you should also rent sofas. When planning your event, you’ll need to know exactly how many people will be attending. Send out your invitations early and set a date for RSVPs. 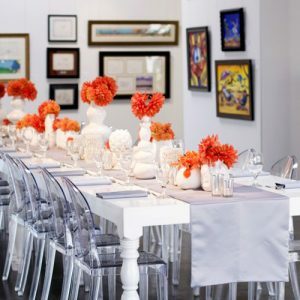 This way you will be sure to rent enough seating to make sure each of your guests is accommodated for and receives a proper place at the table. Having to toss in a spare chair or two throws your whole setting off and appears unorganized. Next, your table rental should match your chair rental. Although you will probably place a tablecloth and decorations on it, your table should be the proper height and style to match your chairs. It will be quite embarrassing if your chairs are fancy, yet do not allow for comfortable seating when pulled up to the accompanying table. The shape of your table plays a role, too. Round tables are great for creating eye contact and allowing your guests to get to know one another. Longer, rectangular tables are easier to place when extra room is desired for a dance floor. Either way, you’ll need to allow plenty of space open for your buffet and entertainment. For the guest or guests of honor, consider a throne chair or a royal chair, strategically placed, so that all the partakers’ attention will be focused in that direction. It will also make it clear to everyone where the guest of honor will be seated. A momentous occasion calls for significant seating, after all. Most events are centered on a theme. By carefully selecting your rental furniture, you can use it to successfully transform the venue so that it brings your theme to life. These days, everyone has a cell phone, and lots of pictures will be taken. Therefore, the visual appeal is important. By creating the perfect setting, you are also raising the spirits of your guests. Bright colors and hues can bring smiles to their faces, which calls for a great time ahead. 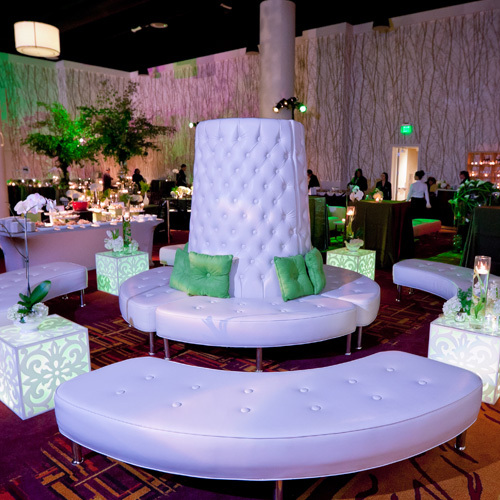 Furniture selection for your event can be more involved than you imagined. Not only is it important to have sufficient seating indoors, but depending on the time of year, location or event, you may also require outdoor seating, as well. Based on the activities you’ve planned, you may require an additional chair and table rental. Creating a checklist can help you decide where you might need more seating. Rent sofas to place in spots where guests might mingle and get to know one another. Outdoor sofas are great choices where you have a lot of open space. Knowing the layout and dimensions of the venue is important, so you can take advantage of every nook and cranny available. Position seating arrangements to take in a spectacular view or other prominent feature of the location. The presentation is everything when it comes to your food and beverages. Additional table rental may be required to place your serving trays, dishes and glasses on. These should also match your decor and be sturdy enough to hold up under pressure. Small, round tables or square end tables can be placed between sofas and chairs for your guests to place their drinks and plates on. A separate lounge area is easily created by setting up a bar and bar stools. No need to build one or purchase one just for this occasion – these can also be rented. If the space is large enough, consider renting lounge chairs and sofas to add to this area. 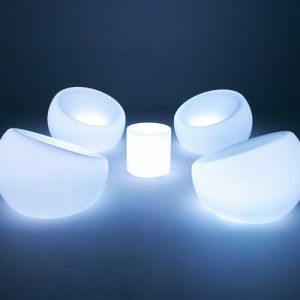 Neon lighting completes the scene, or simply choose furniture that glows to provide an authentic lounge effect. Proper planning is key. Drawing rough sketches can help to give you an idea of how all of your furnishings will look together. You’ll also have an idea of where more pieces can be added. Consider placing an additional throne chair or a royal chair in another section of the room, since the guest of honor will most likely not want to be seated at the dining table the entire time. For large events, most people choose to hire an event planner. Working with an event planner is great, but it is still a good idea to stay involved. After all, this is your vision, and your event is a reflection of you. While your event planner will deal with the vendors directly, it’s best to stay up to date and make changes as needed. By asking questions and doing your homework ahead of time, you can best help your event planner to understand the scene you are trying to create. If you have concerns or need ideas about event chair and table rentals, it’s best to speak directly with an expert who specializes in that field. They can best help you decide which pieces work well together, and how to make the most out of the space you have available. At Lounge Appeal, we’re here to help with your furniture rental questions.Drop us a line, and we’ll be sure to get back to you within 24-hours. If a faster response is needed, give us a call on our toll-free number. We look forward to speaking with you.